Ways to Earn with LBT! Have you earned yourself some gift certificates to put towards that next tattoo? We've got multiple ways to save some $ at LBT! 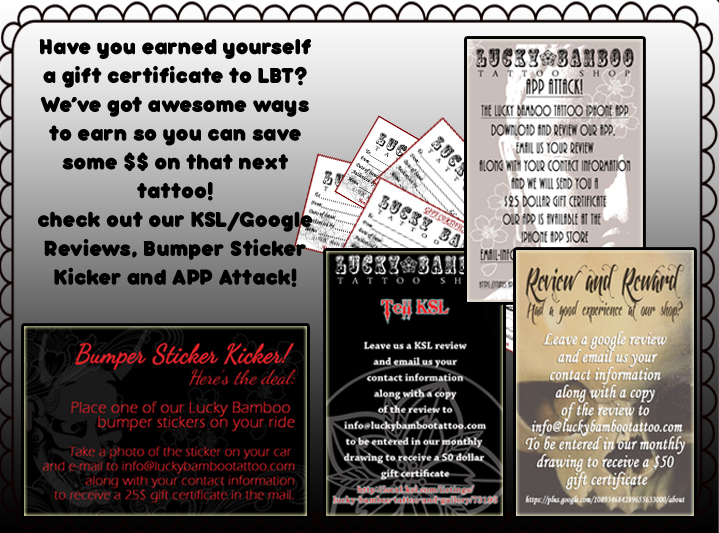 Bumper Sticker Kicker: Put a LBT bumper sticker on your car, take a photo of it and email it to: info@luckybambootattoo.com, we will automatically send you a 25$ gift certificate! App Attack: Download the LBT app in the Itunes store, leave a review telling us what you think, screenshot your review and email it to: info@luckybambootattoo.com, we will send you another 25$ gift certificate! Review and Reward: Did you have a good experience with us? Go to ksl.com or google.com and leave a review telling us about your experience! On the first of each month we do a drawing for a 50$ gift certificate! Winner is announced on our social media sites, so make sure to follow us on Facebook, Twitter and Instagram!